In spite of the many advances in the field of mental health, it is estimated that about 1/3 of our population is suffering from some form of diagnosable mental illness at any given time. The cost of mental health care in the U.S. alone is approximately 1 trillion dollars annually. And, in spite of the good that many medicines do (and in the field of mental health many of these medicines are life saving), it’s also true that in some cases their side effects may actually cause harm. In fact, the third leading cause of death in the U.S. (about ¼ million per year) is iatrogenic, which means caused by the adverse effects of modern medical treatments. So it’s clear that our current system of mental health isn’t doing enough. A new approach is needed. And a new approach requires new knowledge, knowledge that addresses the root cause of the majority of mental disorders. Maharishi AyurVeda possesses both the knowledge and treatment approaches that have the potential to fill this missing gap in our current mental healthcare system. Ayurveda is a 5000 year-old system of natural medicine from India. According to the ancient Ayurvedic texts, one of the eight major branches of Ayurveda is Mental Health. Starting in the early 1980’s, Maharishi Mahesh Yogi, the Vedic scholar who had previously made Transcendental Meditation available worldwide, met with Ayurvedic scholars, doctors and scientists for the purpose of restoring this ancient system of medicine to it’s full dignity. Hence the name “Maharishi AyurVeda”. Stress is now known, through modern research, to be one of the main root causes of many mental disorders. In addition to stress, poor diet, lack of exercise, unhealthy habits (like drug and alcohol use and many other addictive behaviors), and lack of sufficient rest, are additional risk factors for the development (or exacerbation of) mental illnesses. Unfortunately, our current healthcare system is sorely lacking in effective methodologies for reducing stress and finding a way to motivate patients to improve their diet, get more exercise and rest, and to reduce unhealthy habits. Because unhealthy habits are often desperate attempts to cope with stress, stress reduction often results in the ability to make healthier life choices. Transcendental Meditation is the cornerstone treatment of Maharishi AyurVeda. During the practice of T.M., the mind effortlessly settles to the state of pure silence, or pure consciousness.Because of the intimate connection between mind and body, when the mind transcends the field of activity, the body becomes very relaxed. 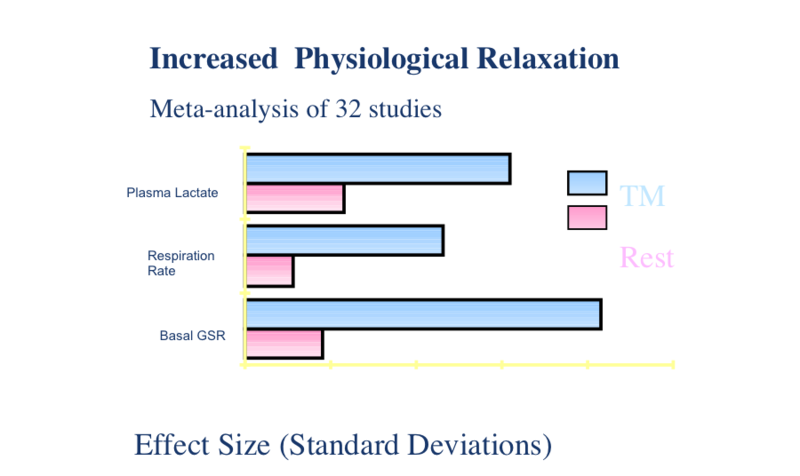 Modern research demonstrates that during this deep level of rest the metabolic rate drops to levels much deeper than is typically seen during sleep. It is this profound level of rest to both the mind and body that enables deep rooted stress and fatigue to be released, in a most effortless and spontaneous manner. For this reason, T.M. along with the other approaches of Maharishi AyurVeda, greatly enhances the self repair mechanisms of the mind-body system. Scientific research indicates that this self repair occurs at the level of the DNA, which may explain the holistic benefits in the area of mental health, that are seen in those who take advantage of the technologies of Maharishi AyurVeda. 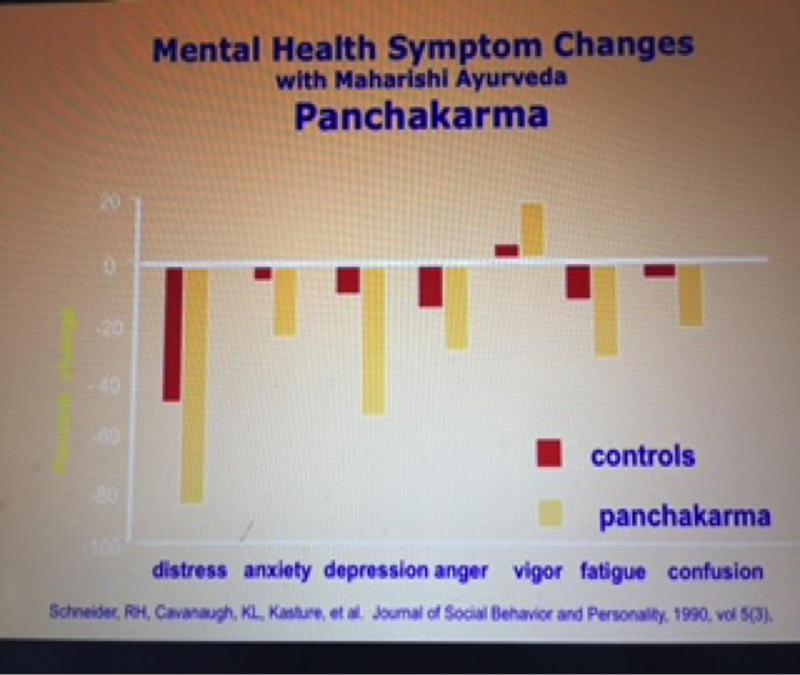 Maharishi AyurVeda addresses the root cause of mental illness, which is stress. Modern psychiatry works at the mental, behavioral, and biochemical levels of the individual, and therefore have some benefit. However, modern treatments are unable to access the root cause of mental imbalance, and therefore modern psychiatry is limited in its ability to achieve its goals. The deepest level of our being, pure consciousness, which is regularly experienced during the practiced of T.M., is a state of restful alertness. 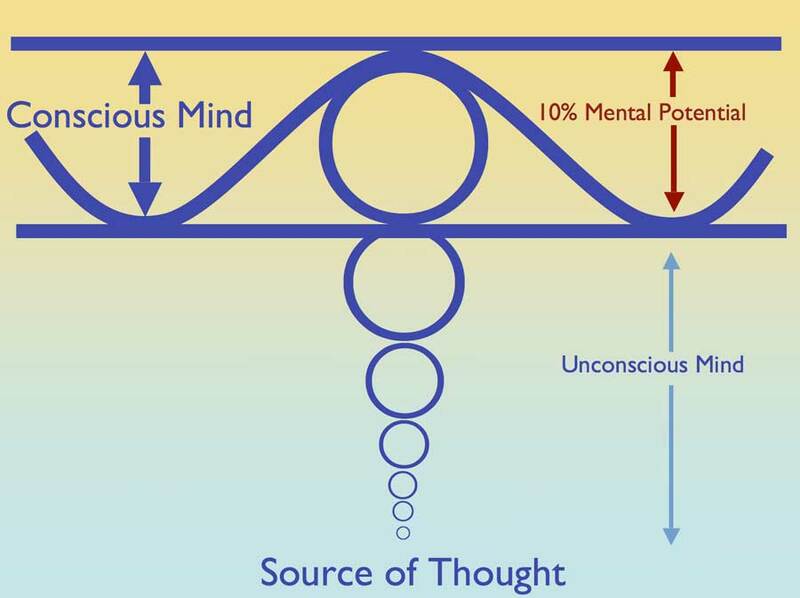 It is correlated with brain wave coherence and profound physiological rest, which in turn enables the self-repair mechanisms of our body to function most efficiently. In addition to T.M., which works at the deepest level of our being, there are a number of other Maharishi AyurVeda approaches that have been shown to be extremely beneficial to our mental health. They include diet and exercise tailored to one’s psychophysiological type, purification processes, herbal tonics for the mind and emotions, suggestions for quality sleep, daily routine recommendations, and developing skills for ideal relationships. I will briefly discuss each of these important complements to one’s meditation practice. Diet According to Psychophysiological Type: Historically Ayurveda has considered an unhealthy diet to be a potential cause of mental imbalance. This is because when our food is not properly and efficiently digested, unwanted metabolic by-products of digestion (called “ama” in Ayurveda) get produced. There are primarily 3 kinds of ama, vata ama, pitta ama, and kapha ama. Vata ama causes nervousness and anxiety, pitta ama causes irritability, and kapha ama causes low ambition and depression. Both one’s psychophysiological type (vata, pitta, or kapha), and the type of food one is eating, determine which type of ama gets produced. A consultation with a trained Maharishi AyurVeda practitioner can help you design an “ama free” diet best suited to your particular constitution. Other factors that produce ama include how fast you eat, how well you chew your food, and the quantity consumed. Exercise According to Psychophysiological Type: Exercise, according to Ayurveda, is considered vital to mental health. Modern medical research has begun to substantiate this ancient prescription. Exercise increases serotonin and endorphins, neurotransmitters that are well known to improve mood. In addition, exercise reduces chemicals in the bloodstream that cause inflammation throughout the body, including in the brain. Inflammation is being discovered to be one of the potential causes of a variety of mental illnesses. However, the degree of exercise that is recommended is dependent upon one’s psychophysiological type. Too little or too much exercise can be harmful, so it’s useful to know whether you are a vata, pitta, or kapha type. Vata types feel their best emotionally with mild to moderate exercise, such as walking or light jogging. If Vata types over-exercise, it can increase anxiety. Pitta types feel best with a moderate amount of exercise. Swimming is ideal for pittas because it tends to keep them from overheating, which in turn can increase irritability. Kapha types feel happiest when they get a greater degree of aerobic exercise. Otherwise they can feel phlegmatic and depressed. In addition, practicing certain yoga postures have been found to increase circulation to the brain, and to produce hormones that are beneficial to mental health. Maharishi AyurVeda recommends a daily hatha yoga routine that serves to enhance our mental health. Along with yoga, breathing exercises, called pranayama, are helpful, in particular, for reducing stress and anxiety. The practice of yoga, together with pranayama, is also beneficial as a preparation for a deeper experience during meditation. Herbal Recommendations: Some of the world’s most renowned quantum field theorists in physics have postulated that our thoughts and emotions are wave functions, similar to the wave functions of light and fine particles such as quarks and leptons. Waves are a vibratory phenomenon. The Maharishi AyurVeda herbal preparations work on many levels of the physiology, such as the biochemical level. But they are also described as working at the quantum level, which includes the level of our thoughts and emotions. Each plant is known to have a specific frequency, or wave pattern, which, when ingested, resonates with specific parts of the body that have a similar wave frequency. Hence, the Maharishi AyurVeda herbs work at a very deep and subtle level. Many studies have shown that certain Ayurvedic herbal preparations can be helpful to improve mood and cognition. Maharishi AyurVeda products such as Mind Plus, Study Power, and Stress Free Mind and Emotions are a few examples of herbal combinations that can help to promote balance in mental and emotional functioning. Body Purification: Also called “Panchakarma” in Ayurveda, these procedures have been shown to be very beneficial to mental and emotional functioning. Some of the treatments used in Panchakarma are oil massage (Abhyanga), Shirodhara (oil poured over the forehead), and basti (herbalized enemas). The combination of these and other purification therapies work to systematically remove toxins from the cellular level of the body. The result of these detoxification procedures is improved mood and mental clarity, amongst many other benefits. Ayurveda recommends doing body purification for 3-5 days once or twice per year. The Raj in Fairfield, Iowa, along with many other Maharishi AyurVeda Clinics in the U.S. and around the world offer these treatments. Daily Routine: The importance of a healthy daily routine for optimal mental health cannot be overemphasized. It’s well established in the medical literature that not getting enough sleep can increase depression and anxiety, and impair cognition and mental focus. According to Ayurveda, getting to sleep by 10 pm is ideal, as that’s the time when kapha dominates and a person is most likely to be naturally sleepy. That’s when melatonin levels are highest for most people. Melatonin is produced by the pineal gland and induces sleep. Maharishi AyurVeda preparations like Blissful Sleep can be helpful to promote improved sleep. In terms of the timing of meals, eating three times a day with the largest meal at noon (when agni or the digestive fire is strongest), with supper being light and not too late, is ideal. Transcendental Meditation twice daily and regular exercise are also critical for optimal mental wellbeing. Some regular socialization with loving supportive friends at least a few times a week has also been found to promote longevity and improved mental health. Relationships: Maharishi AyurVeda recognizes that the quality of our close relationships greatly impacts out mental health. Most people experience that on days when there is conflict in our intimate relationships we feel emotionally unsettled, as compared to feeling more happy and peaceful on days when there is a feeling of closeness and harmony. Learning skills to effectively communicate and work through the disharmony when it arises is vital to our mental peace and happiness. In addition to learning healthy relationship skills, it is helpful to do all the above recommendations of Maharishi AyurVeda in order to first be emotionally balanced within ourselves. When we feel content within ourselves, our joy overflows and it’s natural to want to give to our loved ones. When a glass is partly full, the water doesn’t go anywhere. When the glass is full, the water overflows. So, taken as a whole, the approaches of Maharishi AyurVeda have been found to have a profound effect on improving our mental health and wellbeing. 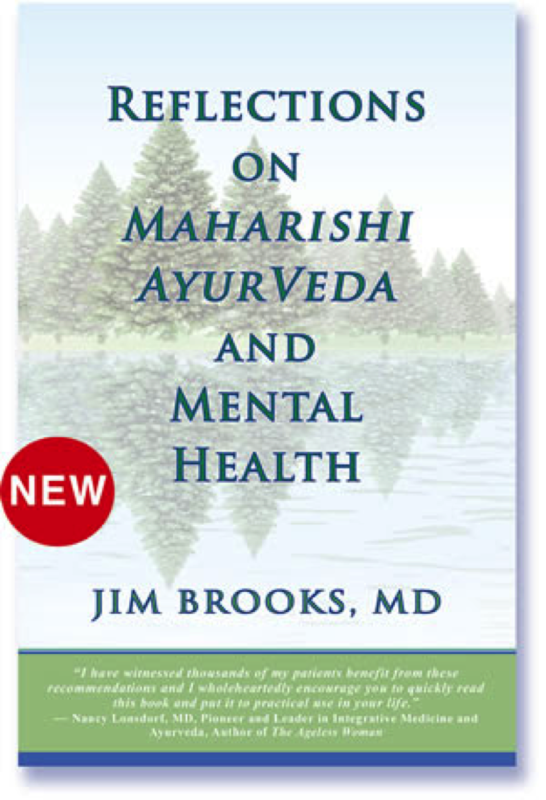 Reflections on Maharishi AyurVeda and Mental Health by Jim Brooks, MD. Chronic mental disorders, including depression and anxiety, are leading causes of morbidity, disability, and loss of quality of life. It is estimated that as many as one-third of all Americans suffer from some form of mental disorder. In this practical and very readable work, Dr. Brooks addresses the inability of modern medicine to prevent and treat these chronic disorders. He proposes an effective solution found within the world’s most comprehensive and ancient system of natural medicine—Ayurveda. World-renowned Vedic scholar and teacher Maharishi Mahesh Yogi, in collaboration with leading Ayurvedic experts, scientists, and physicians, conducted a modern revival of Ayurveda known as Maharishi AyurVeda. Dr. Brooks anticipates that the Maharishi AyurVeda approach to mental health, or Vedic psychiatry, will have a major impact on how medicine understands, prevents, and treats mental disorders. 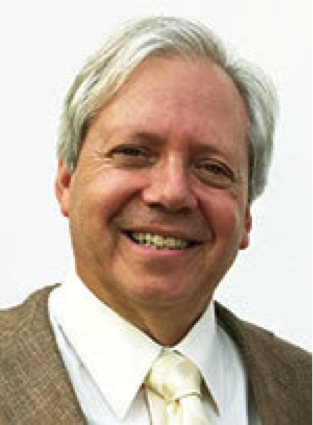 Jim Brooks, MD, has spent his life helping people create health for themselves through natural medicine. He is a practicing psychiatrist who has studied and applied Maharishi AyurVeda for many years. He received extensive training from some of the most renowned Vaidyas (Ayurvedic physicians) in India. He is also a teacher of the Transcendental Meditation technique and has authored many journal articles and book chapters on Ayurveda and mental health.